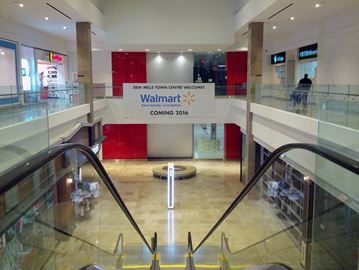 Walmart will be moving into the old Target location at Erin Mills Town Centre. A 136,000-square-foot Walmart Supercentre will open sometime in 2016 and will employ approximately 250 people, according to release issued by the mall. Walmart will be the mall’s third anchor store, alongside Sears and The Bay, and will offer groceries, electronics, home décor and apparel. The announcement comes after the large two-storey Target location has sat conspicuously empty since the American retailer pulled out of Canada last year. Last January Target announced it was shutting down its Canadian operations, resulting in the loss of 17,000 jobs and the closure of all 133 Canadian locations, including seven in Mississauga and Brampton. Target sought creditor protection, less than two years after opening its first Canadian stores following an aggressive expansion that saw the retailer purchase the leases of former Canadian retailer Zellers for $1.8 billion in early 2011. Target’s failure in the Canadian market was chalked up to its inability to keep shelves stocked or meet consumer pricing expectations. Brian Cornell, Target Corp. chairman and chief executive officer, said at the time that the earliest the chain could be profitable in Canada was 2021. The Target store at Erin Mills Town Centre only operated for a short time, opening August 2014 and closing April 2015. The new Walmart is expected to open this year after renovations are complete. No specific timeline was provided. Meanwhile, the fate of the Walmart at South Common Centre, located at Burnampthorpe Road and Erin Mills Parkway, just a few blocks from Erin Mills Town Centre, was not immediately available.